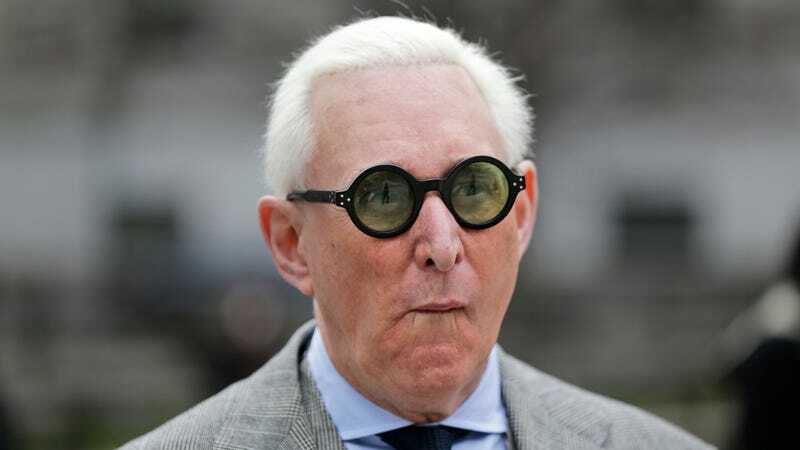 Roger Stone, longtime Trump associate and Babadook, was arrested on Friday morning by the FBI at his home in Fort Lauderdale, Florida. The seven-count indictment suggests Stone misled lawmakers on the committee about his efforts to communicate with Wikileaks and his contacts with the Trump campaign. It also alleges he attempted to intimidate another witness: radio host Randy Credico, who was in contact with Wikileaks head Julian Assange in 2016. Special counsel Robert Mueller’s office said Stone was arrested Friday morning and will make an appearance at 11 a.m. at the federal courthouse in Fort Lauderdale. A Washington D.C. grand jury approved the indictment Thursday. This extended video shows Stone opening his door wearing what appears to be, at least in silhouette, either long basketball shorts or a robe, but definitely some kind of soft fabric that cuts him right at the knees. What would you wear if you knew you were going to be arrested by the FBI at your Fort Lauderdale home? Crime Time for Don Jr.?